Episode recorded on August 28, 2015. Green tea with cherry blossom and vanilla. Susanne blouse by Citronille, out of Liberty Mitsi. – The Mini Spinalong is extended until Christmas. You can use #minispinalong on Instagram. There will be random drawings from now until Christmas, in the spirit of #operationsockdrawer hosted by the Knitmore Girls, from the hashtag on Instagram and the chat thread on Ravelry. 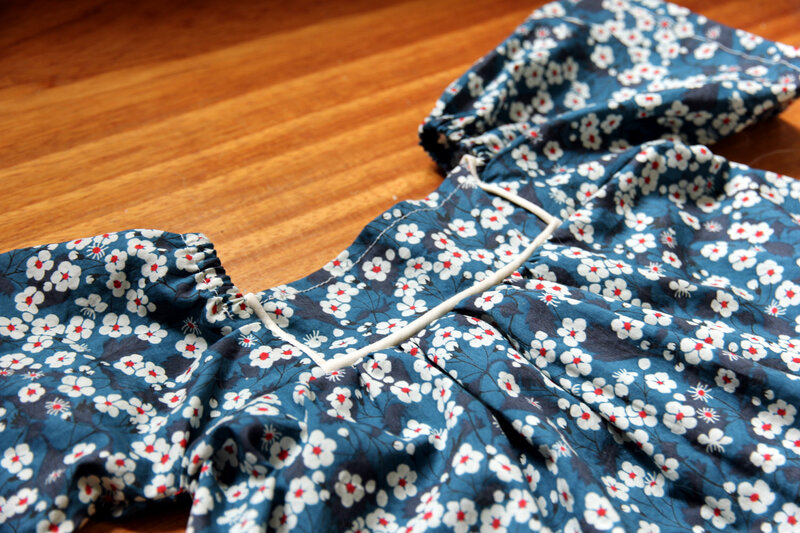 I purchased some floral fabric at Toto to make a skirt for my daughter and a Flora Dress for me. – Planning a Tiny Tea Leaves cardigan for my daughter out of Malabrigo Rios in the Solis shade. I received a lovely package from Sara’s Texture Crafts, with some Odd Sox yarn for my daughter and me in the Iris colourway, and gorgeous merino and silk noils batts as a prize for the #minispinalong. I finished my crocheted Hexagon Blanket while we were in the Cévennes. – Whitefaced Woodland from woolforbrains. – Pebbled Beach in Shetland and sea cell from Sara’s Texture Crafts Colour Club I. I am planning to ply it with laceweight yarn (probably Drops Lace), and wonder what I should be particularly careful about.